The Port Angeles Fine Arts Center gallery, originally the private residence of Esther and Charles Webster, was designed in 1951, by Paul Hayden Kirk, as both a residence and artist’s studio. 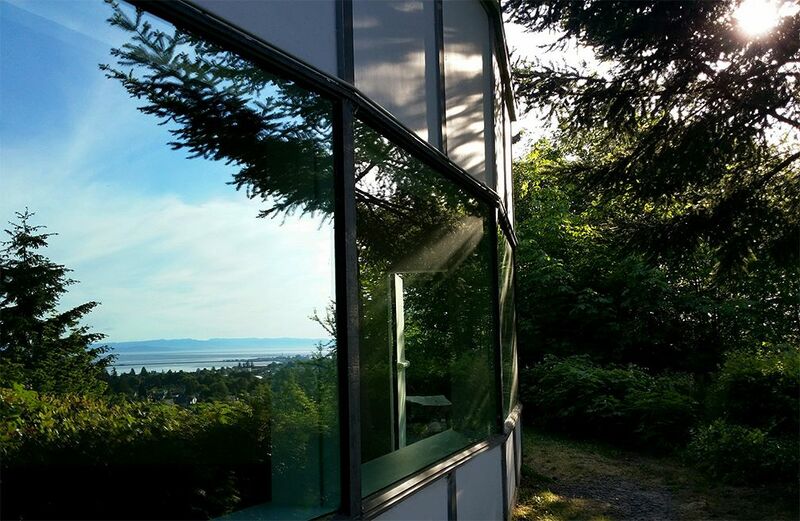 The Webster house is a plate-glass-and-timbered classic of modern Northwest architecture. Kirk’s generous use of voids and indigenous materials offers a low-impact structure - which ushers indoors the abundance of the natural world. Perched on the lip of the Olympic foothills, the house’s great-room-turned -gallery affords a regal vista of the city and a vast territorial view of the Strait of Juan de Fuca and Vancouver Island. In the other direction, the snow-capped spires of Olympic National Park cast an inspiring shadow, like silent sentinels. Paul Hayden Kirk, one of the most widely recognized architects of the Post-War Northwest, developed an eclectic style which adapted the principles of Mies van der Rohe, to the nature-drenched environment of the Pacific Northwest. He designed many private residences in the Puget Sound region, including one other in Port Angeles. Kirk’s great sense of integration and the use of native building material, the merging of the outside and the inside, a blending of public and private space, allows the Webster House to work so well as a showcase for art. With its arching walls of glass and shining concrete floor, it presents an atmosphere conducive to observation and reflection.